Hey you all. If you haven’t heard this one yet, you should it’s great! 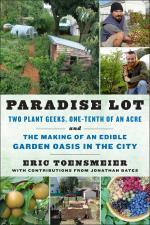 The Paradise Lot garden is the story with a carbon farming twist. Nice job Eric! 1) Genetic testing to determine whether individually dispersed naturalized growth of kiwi vine is speculative, due to the fact that many of these vines were likely planted over 100 years ago and at that time all vines planted as ornamentals where seedlings, thus they cannot be tracked back to known varieties, thus they are incorrectly assumed to be wildlife dispersed seedlings and labelled “invasive”. 2) If this legislation was in place 200 years ago, apples would have been banned, and the entire New England apple and cider industry would be illegal. Sorry Johnny Appleseed. 3) Invasive Biology is a Pseudo Science. Ever eaten a paw paw or American persimmon? Here is your chance! Come join us for an exciting event Saturday, October 15, we will be touring Paradise Lot learning about the garden and how it was designed, and eating the fruit that is in season. In the afternoon we will visit Tripple Brook Farm for more fruit and nut tasting and a tour of Steve’s wonderful and diverse landscape, seeing mature kiwi vines, chestnuts, hazelnuts, paw paws, apples, persimmons and more! Help Apios Institute develop a global wiki of perennial crops & polycultures to combat climate change! Multistrata agroforestry systems go by many names – food forests, edible forest gardens, tropical homegardens, and more. What they have in common is their structure – multiple layers of vegetation, typically one or more layers of trees, with further layers of shrubs, vines, herbaceous species, and often fungi and/or livestock. These “agroforests” can be at a tiny backyard scale or big enough to cover 50-70% of entire islands. Contemporary commercial examples include coffee and cacao under nitrogen-fixing shade trees. Multistrata systems go back 13,000 years in Java, and today are practiced on an estimated 100 million hectares globally (247 million acres), mostly in the humid tropics. Home-scale systems appear quite viable in cold climates, but models of commercial cold-climate hard to find – in deed development of such systems is one of our goals. Multistrata agroforestry systems sequester outstanding amounts of carbon – some as high as 40 tons per hectare per year (t/ha/yr). This compares extremely favorably with often-recommended carbon farming strategies like no-till (0.3 t/ha), “regenerative organic” annual crops (2.3), and managed grazing (0.3). Some even sequester carbon at faster rates than adjacent natural forest! Tropical homegardens have the highest levels of biodiversity of any human land management technique. For example, Mesoamerican homegardens average 348 species per hectares (149/acre). In some cases these systems produce more food than monocultures – sometimes much more! For example, in Brazilian oil palm monocultures, oil yields average 5 t/ha. Polycultures of oil palm, with the addition of fruiting vines, nitrogen-fixing trees, and other elements, produce 8.7 t/ha of oil, plus the additional products! The very complexity that makes these systems so fantastic makes them hard to study, and greatly slows their spread. Outside of the tropics models are few and far between. Jonathan Bates and Eric Toensmeier, the creators of Paradise Lot are volunteers on the board of the Apios Institute and we believe this technology will help farmers and communities around the world gain knowledge and implement these systems faster. I’m fascinated by the idea that humans now live on a planet that is no longer “wild”. Because of our influence we have changed the face of the living world forever, climate change only being the newest and largest disturbance by our species. Paradise Lot is a microcosm of the impact humans are capable of – in this case a positive impact. Eric and I designed and implemented an “edible novel ecosystem” made up of native and non-native plants on land once devoid of much diversity. It is likely that the assemblies of plants we planted together have never grown in quite this way ever, and yet life is thriving, producing increasing abundance. Along with this, I might add that when considering how humanity will treat “the new wild” from here on, we design-in diverse useful and edible plant and animal communities when restoring our landscapes. Instead of thinking what might seem best for nature based on historical assumptions, we design for what could be the most abundantly useful to us and our fellow species, considering the environment and culture of each place. Human’s have the potential to be destroyers or creators. The earth and life will continue on despite what we do. Wouldn’t it be more interesting if we came along for the ride.